A Reputation As Reliable As Our Firearms! There are many gun shops in New Hampshire and Massachusetts for the discerning firearms customer to choose from, but there is only one with a reputation that is as reliable as the products they sell: Old Glory Guns & Ammo. Located in Mason, NH, Old Glory Guns & Ammo has been proudly serving the firearm and ammunition needs of NH and MA since 1988. Since then, we may have changed our name to reflect a change in ownership, but our continuing dedication to remaining the most reliable and dependable gun shop in New Hampshire has not changed, and it never will. Whether it be in terms of the firearms we sell here in Tax-Free New Hampshire, or the quality of our customer service, Old Glory Guns & Ammo has achieved its sterling reputation through many years of providing our customers with nothing but the absolute best. We have the resources, inventory and expertise to assist you with your every question, concern or request. Were you recently gifted a firearm that you know nothing about? We can tell you anything about it you want, and need, to know! Were you wondering if your grandfather’s old sidearm was still safe to fire? Our fully-licensed technicians would be glad to examine and repair your weapons if necessary. 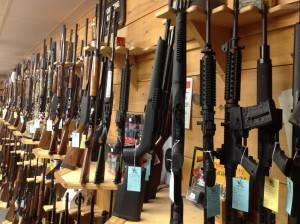 Whatever you may need out of a gun shop in New Hampshire or Massachusetts, we will make sure that you are completely satisfied and confident with everything having to do with owning and operating a firearm. We have the expertise to tell you everything you need to know, and with over 1000 firearms in stock at any given time, we have the inventory to provide you with exactly what you are looking for. At Old Glory Guns & Ammo, our commitment is to you! Feel free to call us at 603-878-2854 to learn more about how we can assist you with all of your firearms-related needs!